Stronger economic growth will generate an $8.9-billion improvement to Ottawa's finances this year, which has allowed the Liberal government to forecast smaller deficits and announce future increases to programs aimed at low– and middle-income Canadians. The extra $8.9 billion that has come in since the March budget will be put toward lowering the deficit this year, but the government announced two new policy measures that will have a combined annual cost of $1.9-billion a year by 2021-22. The government is moving up its timeline by two years for indexing the Canada Child Benefit to the cost of living. This will now take place in July 2018. The government also announced Tuesday that it will enhance the Working Income Tax Benefit by $500-million a year starting in 2019, with further details to come in the 2018 budget. The deficit is now projected to come in at $19.9-billion this year, compared to the $28.5-billion forecast in the March budget, including adjustments for forecasting risks. The fall update projects that annual deficits will decline gradually over time, reaching $12.5-billion in 2022-23, the final year of the forecast. 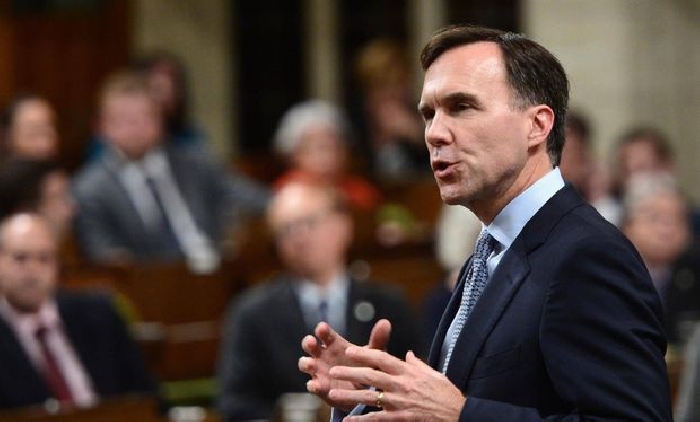 Morneau defended his decision not to set a target for eliminating the deficit. He said the debt-to-GDP ratio is on track to decline to levels not seen since the 1970s. "That's the balance we sought back in 2015," he said. "And all I can say is to the people who told us back then that we should be balancing the budget at all costs: Look at the results. Our decision to have faith in Canadian families has put us in a position where we have the fastest growth among G7 countries." Tuesday's update said private sector economists now expect the Canadian economy to grow by 3.1 per cent in 2017, up from the forecast of 2 per cent in the March budget. The update noted that over the past year, the Canadian economy grew by 3.7 per cent, which led the G7 by a considerable margin, with the United States in second with 2.2 per cent growth. The Canada Child Benefit was a Liberal campaign pledge. It was enacted in the Liberal government's first budget by replacing three other programs aimed at families with children. The program's benefits were not indexed to inflation, but the government had pledged that indexation would begin in 2020. A report by the Parliamentary Budget Officer said the benefit cost Ottawa more than the three programs it replaced. However, if no indexing were to take place, the cost would fall back in line with the cost of the old system of child benefits. The Canada Child Benefit is a non-taxable benefit that is geared to income and based on the number of children in a family. For families with incomes under $30,000, the benefit is $6,400 per child under six and $5,400 per child aged six to 17. Earlier this month, Bank of Canada Governor Stephen Poloz told reporters that the program has had a "pretty significant" impact on the Canadian economy. He said it may have boosted workforce participation rates by giving families enough money to afford child care rather than staying at home with young children. he PBO also said the government's original plan for indexing the benefit in 2020 would cost $1.4-billion in the first full year, rising to $5.8-billion a year by 2026-27. The government said Tuesday that indexing the CCB sooner will provide an additional $5.6-billion to Canadian families over the 2018-19 to 2022-23 period. As for the Liberal government's new projections for the bottom line, Tuesday's update forecasts a $19.9-billion deficit for 2017-18, which includes a $1.5-billion adjustment for risk. Projections for future years include a $3-billion annual adjustment for risk. Those update forecasts show deficits of $18.6-billion in 2018-19; $17.3-billion in 2019-20; $16.8-billion in 2020-21; $13.9-billion in 2021-22 and $12.5-billion in 2022-23.